Specialty Printing & Fabrication - Light-Works, Inc.
We’ve been doing this long enough to know that a poster or banner isn’t always enough to make a statement or differentiate. Specialty printing on substrates like wood, found materials, plastics, aluminum, and acrylic are right in our wheelhouse. We’ve built complete custom menu systems and 3D displays for all the Ben & Jerry’s shops in North America, and design, produce, and install creative solutions for retail and event display for several organizations. We forge strong relationships with our valued clients and work hard to understand their marketing and display challenges, creating effective and functional customized retail graphics that do the job. Ranging from a start-up that needs to stand out in the crowd at their trade show, to a 250-location roll out of a turnkey store retail display system, Light-Works has the proven experience to help you make something special. UV curable printing allows us to direct print on a wide variety of materials, opening up opportunities for stunningly unique display work. 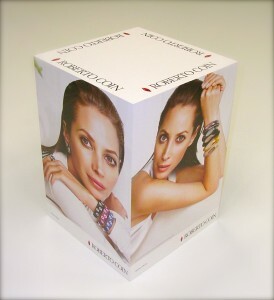 When our European jewelry client needed something more than a traditional banner or poster for their sales events, we created the cube, a 5-sided, 3D box created using Sintra with fine beveled edges, customized to any size, with their high-end visual graphics direct printed on all sides: a powerful way to show off their new campaign. For Ben & Jerry’s scoop shops, we started with designs for 3D retail displays showing their mission using found art, sustainable direct printing, and custom cutting. We used Wheatboard, a pressed board made up of 100% post-consumer wheat waste and well-worn sheets pans from a bakery in Vermont. 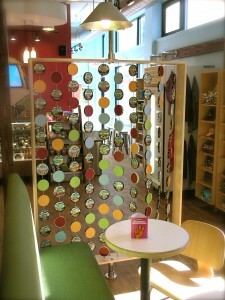 These displays, called “Art Packs”, are installed in scoop shops worldwide. Besides using creative and sustainable materials, it was essential to make the displays affordable and shippable. Our printing, cutting, fabrication, together with our competency of collaboration made these projects and many others like them a success.